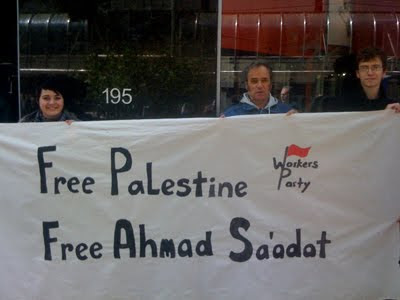 New Zealand's largest Marxist-Leninist organization, the Workers Party is openly funding the Popular Front for the Liberation of Palestine. An overtly Marxist-Leninist grouping inside the terrorist Palestine Liberation Organization , the PFLP is dedicated to the total destruction of Israel. Once supported by the Soviet Union and China, the PFLP is now aided by New Zealand student Marxists hawking '''r-r-r- revolutionary''' T Shirts on campus and at flea markets. The majority of the money has been raised through the sale of "Resistance is not Terrorism" t-shirts throughout the country. A new t-shirt is being designed featuring Leila Khaled, PFLP activist and resistant fighter, and will be released at a nationwide launch on the anniversary of the creation of the Zionist state of Israel, known by Palestinians as the "Nakba", or catastrophe, on May 15th. The campaign opposes the re-establishment of an Israeli embassy or any diplomatic relations with the Zionist state and deplores a recent announcement by Murray McCully, that a Working Holiday Scheme will "deepen our tourism and education links, and over time contribute to growth in our bilateral commercial, trade and investment links" with Israel. "instead of extending diplomatic ties with Israel we should be cutting them altogether, following the examples of Venezuela and Bolivia"
The Workers Party action is clearly designed to challenge NZ anti-terrorism laws that explicitly ban financial contribution, or other support to government listed "terrorist" organizations. The campaign seeks to challenge the political paradigm that allows legitimate National Liberation movements to be labelled as terrorist organisations, and the undemocratic way in which terrorist laws are administered. Prime Minister John Key recently added organisations to the 'terrorist list' in New Zealand, with no consultation, justifying it by stating they engaged in "terrorist acts including the indiscriminate killing of civilians and assassination of political leaders." This statement lacks any credibility when New Zealand’s government seeks to strengthen links with the state of Israel that targets and kills political leaders, trade unionists, writers, cultural exemplars, community activists, local leaders, and student organisers while waging an economic and military war against a civilian population that has been under the tyranny of the longest running illegal military occupation in recent history. It will be interesting to what action, if any, the New Zealand government takes against the Workers Party for what seems to be a clear and deliberate breach of the law. The PFLP is not on the NZ government's list of designated terrorist groups. Therefore the Workers Party are doing nothing illegal.